Work-related musculoskeletal disorders (WMSDs) such as tendonitis, carpal tunnel syndrome, sciatica, and rotator cuff syndrome are often caused by repetitive motions, awkward postures, or forceful exertions. Washington State Checklists (including caution zone and hazard zone), developed more than 20 years ago, have been widely used by practitioners to identify issues that may lead to musculoskeletal disorders. Recently, following 5-year surveillance project (funded by a NIOSH grant) a new industry-specific WMSD hazard evaluation tool has been developed and disseminated, intended to be used by employers and public/occupational health practitioners to assist them in focusing WMSD prevention efforts. Through workers' compensation claims data analysis, musculoskeletal risk assessment of jobs during company site visits, and interviews with management, labor, and injured workers themselves, the new checklists consider the nature of WMSD risk factors in manufacturing, healthcare, agriculture, services, wholesale and retail, and construction industries. Dr. Jia-Hua Lin is a research ergonomist with the SHARP (Safety and Health Assessment of Research for Prevention) program within the Washington State Department of Labor and Industries. He is appointed an affiliate associate professor in the Department of Environmental and Occupational Health Sciences at the University of Washington – Seattle. He currently serves as a scientific editor for the journal Applied Ergonomics. Dr. Lin’s research topics include physical ergonomics and occupational biomechanics, particularly in upper extremities; strength and capacity; human-tool interface; general occupational safety and health; and office ergonomics. His collaborations extend to domestic and international universities and hospitals. A member of the Human Factors and Ergonomics Society (USA), and a BCPE (USA) certified professional ergonomist, Dr. Lin graduated from University of Wisconsin-Madison with a Ph.D. and M.S. in industrial engineering. He earned his B.S. 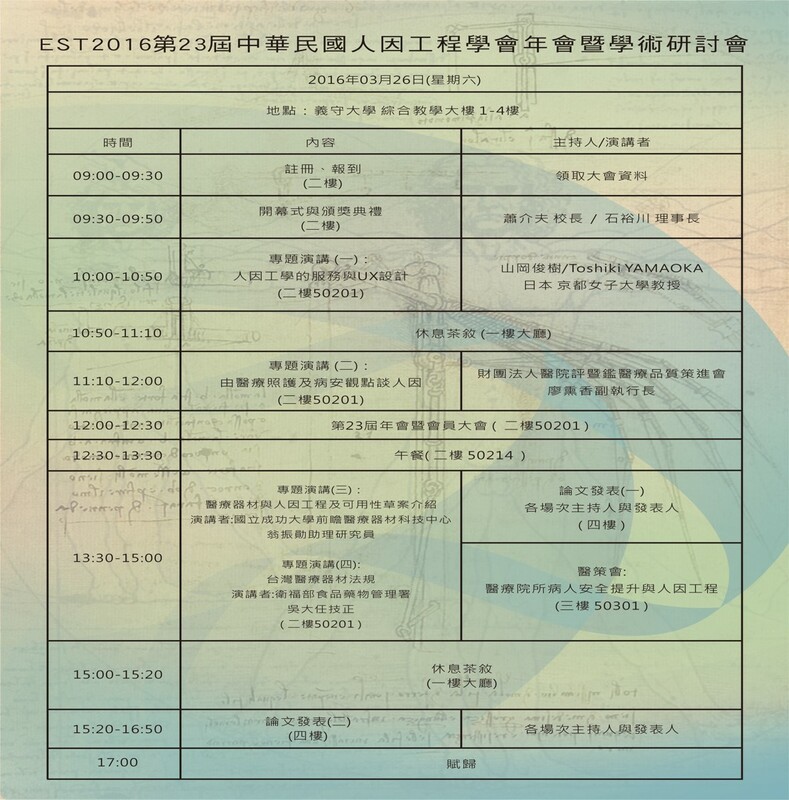 in electrical engineering from the National Taiwan University, Taipei. It is our great pleasure to announce that The 2nd Asian Conference on Ergonomics and Design (http://aced2017.org/). will be held at the College of Industrial Technology, Nihon University in Chiba, Japan from June 1 to June 4, 2017. This conference is an IEA endorsed event and it will be held in conjunction with the 58th Annual Conference of Japan Ergonomics Society. The theme of ACED2017 is “Towards the Asian center of comfort and functional design”. With a recognition that potential demands for ergonomics in Asia is enormous, we intend to make ACED2017 as an interdisciplinary platform for encouraging scholarly exchange, dissemination of multidisciplinary ergonomics sciences and practices, and collaborations in Asia. We attached a leaflet to describe full detail including special sessions, tours and other important information. We would kindly request you to forward this leaflet to your society members. Meanwhile ACED2017 official website (http://aced2017.org/) will give you the updated information for you, so please visit our website as well. Also, if it had not been done yet, please provide your society logo to ACED2017 so that we include it on ACED2017 website shown as a council member society of ACED. Please see attached the AEC 2017 international alliance complimentary registration form. If you or another member of the Ergonomics Society of Taiwan would like to attend the AEC 2017 and use the one complimentary registration being offered to the international alliance partners, please fill out the form and send it to Bill Gibbs (bgibbs@iise.org), the conference manager. Please write “Ergonomics Society of Taiwan” next to “VIP – Complimentary” so that Bill can identify which alliance partner is sending the form. Let me know when the form is sent to Bill so that I can confirm if he received it. If you prefer to send it to me I will then forward it to him. Please note that if any paid event is chosen (besides the complimentary registration), the early-bird registration ends on January 22nd, 2016. There are some complimentary events that would be interesting to attend but the boxes close to their names need to be checked on the form like: “Welcome Reception”, “Ergo Speed Networking Event”, “First-timer Orientation”. You are cordially invited to participate in the 3rd International Conference on Ambient Intelligence and Ergonomics. The conference objective is to provide an international forum for the dissemination and exchange of scientific information on theoretical, generic, and applied areas of ambient intelligence and ergonomics, including their theories and applications in safety, healthcare, digital human modeling, affective and pleasurable design, advanced manufacturing system, future product design, and service engineering. All submitted abstracts will be peer-reviewed by two independent referees from the international program boards. It is anticipated that a broad range of research and applied topics will be covered during the conference. Good abstracts will be selected and be asked to provide full paper for further consideration of publication in the special issues of international journals which are indexed by EI, SCI or SSCI. GOErgo supports the Annual Applied Ergonomics Conference and Expo, a conference where attendees gather from around the world to share best practices with other professionals in ergonomics, healthcare, safety, human resources and risk management. GOErgo is a community within IIE, an international, non-profit association that provides leadership for the application, education, training, research, and development of industrial engineers, human factors/ergonomics professionals, healthcare providers and related professions. Mark your calendar for March 27 - 30, 2017 and plan to join us at Disney's Coronado Springs Resort, Orlando, Florida and take advantage of the opportunity to improve your ergonomics skills, gain insight and connect with global professionals within the healthcare, human factors, government, manufacturing and safety and energy industries at this year's conference. Attend multidisciplinary educational sessions for all experience levels. Expand your knowledge of crucial topics affecting the ergonomics community. Join in on the roundtable discussions and share opinions, strategies, new initiatives and brainstorm on various topics. Come early and attend one or two of the interactive pre-conference workshops. Submit an abstract and share your experiences, applications, research and lessons learned with others! We are delighted to invite you to submit your research paper to be presented at the 4th SEANES International Conference on Human Factors and Ergonomics in South-East Asia (SEANES) 2016. The conference is endorsed by International Ergonomics Association (IEA). SEANES 2016 will be held at Crowne Plaza Bandung Hotel, nestled in the heart of Bandung city, Indonesia, 28 November - 1 December 2016. This year conference is hosted by Perhimpunan Ergonomi Indonesia (Indonesian Ergonomics Society) in collaboration with Institut Teknologi Bandung (ITB) and Universitas Katolik Parahyangan (UNPAR). The conference focuses on the theme "Green Ergonomics: Sustainability, Productivity and Well-Being". We welcome your full paper submission through EasyChair conference system before 11 July 2016. We accept all papers on the topic of green ergonomics, physical ergonomics, cognitive ergonomics, aging and healthcare, health and safety, defence and security, transport and navigation, modelling and simulation, social media, product design, human-computer interaction and user experience. The next congress HEPS (Healthcare systems Ergonomics and Patient Safety) will be held in Toulouse (France) from 5 to 7 October, 2016. We have the pleasure to announce you that the online submission is now available. Thanks for your interest in this congress. Croatian Ergonomics Society requests for IEA endorsement for the 6th International Conference "Ergonomics 2016" organized by Croatian Ergonomics Society, which will be held in the period 15-18th June 2016 in city of Zadar, Croatia. The AHFE International Conference brings a unique opportunity for interaction among experts and industry professionals. We are proud to bring together top researchers and industry participants from around the world. We are pleased to announce the 7th International Conference on Applied Human Factors and Ergonomics (AHFE) 2016 and the Affiliated Conferences will be held at Walt Disney World® Swan and Dolphin Hotel, Florida, USA July 27-31, 2016. (www.ahfe2016.org). AHFE 2016 Conference Proceedings will be Published in Springer Multi-volume Edited Books. The books of AHFE series are submitted to ISI Proceedings, EI-Compendex, DBLP, SCOPUS, Google Scholar and Springerlink. We look forward to welcoming you to AHFE 2016 at the Walt Disney World Resort in July 2016! The University of Michigan Center for Occupational Health & Safety Engineering will be running a two-day workshop the weekend prior to the IEA 2015 Triennial Congress on the 8 and 9 August. Registrations are now open for the course via Cvent. Please follow the link above to the webpage for further information and the link to Cvent to register. Please contact Stephanie Cassidy: pdofficer@ergonomics.org.au if you have any questions. NOTE: IEA Congress Delegates receive a discounted registration rate, but proof of full IEA 2015 registration is required to be provided. The APCHI 2015(Asia Pacific Computer-Human Interaction conference 2015), the 13th of its kind will be held in Singapore from the 2nd to 6th of November 2015. As a long-standing series that started in 1996, this marks the conference’s return to Singapore in 15 years ever since it was last held here in year 2000. APCHI 2015 aspires to bring together industry practitioners and research academia, creating a platform for sharing and exchanging of ideas and knowledge on computer-human interaction and related areas in computer & communication technologies, human, design, organisation and social sciences. It is also an opportunity for people who share similar interests to meet and gather at the conference. You may visit our conference website at apchi2015.com for more information. The theme for this year’s conference is Humanising Experiences, where focus is placed on making computer-human interaction more human due to the ever changing landscape of technology. The new era of smart devices, Internet of Things (IoT) and other new technologies has placed even more importance on computer-human interaction as many industries begin to shift their focus towards being human-centric. He is currently planning to hire a full-time ergonomist in China (Shanghai and Beijing). He is attaching the Job Description with the document. This year conference incorporates 20 thematic areas with participation of more than 1,600 researcher and industry participant. AHFE 2015 provides a unique opportunity for researchers with state-of-the-art products, systems and services. The conference proceedings will be published and indexed in the prestigious Elsevier ScienceDirect Procedia. You are invited to submit an abstract (300 words) for paper presentation or poster demonstration. The submission system will be open for receipt of abstracts and paper proposal submissions. Do not miss this exciting opportunity, the deadline is approaching quickly! We've extended the deadline for the IEA Triennial awards until March 30, 2015! Please circulate the attached information to your society members and encourage them to submit for an award. The IEA Awards Committee is receiving nominations for eight IEA Triennial Awards, including two new awards – the IEA Human Factors and Ergonomics Prize and the IEA/Elsevier John Wilson Award. Please submit your nominations to PastPres@iea.cc March 30, 2015 to be considered. Recipients for the first four awards listed below are selected by the Awards Committee based upon nominations from federated societies. The IEA President's Award is selected by the IEA President who may receive nominations from the Council and Executive Committee. The winner of the K.U. Smith Student Award is selected by the Student Awards Committee. You will find the information on our two new awards, as well as the others in the attachment. The Early Bird Registration for the IEA Triennial Congress is now open!! Please share this notice with your society members. We are excited to open registrations for the 19th Triennial Congress of the International Ergonomics Association. Join your colleagues at IEA 2015, register your place here. A host of social activities are being planned around the event that will tap into Melbourne’s culture and provide fantastic networking activities for all delegates. This is the URL for special issue on “digital human crowd modelling and simulation”. Please encourage your colleagues and students to submit their work. Early-bird Registration Opening Shortly. Industry Partnership Welcome. The IEA 19th Triennial Congress (IEA 2015) is continuing to build on the foundations of the recent 2012 Brazil, 2009 China and 2006 The Netherlands congresses, to bring to the Asia Pacific region and the international ergonomics community a relevant and inclusive congress experience. We have confirmed two international keynote speakers, Dr Sue Hignett and Dr Clas-Hakan Nygard, and are actively building our program from a strong abstract submission response. Further program information is http://iea2015.org/index.php/program/invited-speakers. We thank you for your support of the congress. We are aware that, regrettably, there has been some problems with the submission deadline date on different websites, we therefore extend the deadline to December 7 (Midnight Greenwich time). We ask you to support us by notifying all of your members and contacts and encouraging them to submit their abstracts now that they have more time to do so. We remind you that abstract submissions close soon so please encourage your members to submit early. We have had some queries that we would like to clarify so we ask that you forward this email to you members. Only one abstract is required for these categories initially. We understand that many Chairs wish to submit an abstract for a symposium or panel proposal by 30 November and organise the detail about the presenters' individual papers later. Alternatively, each presenter in the symposium/panel can provide just a few sentences in the initial abstract to indicate what they will be presenting but they can submit longer abstracts if they want to. If the symposium abstract is not accepted then we will consider each of the individual presenters for the oral program. Abstracts are to be a maximum of 800 words. There is no minimum length, however they will need to be long enough to show what your presentation is about. Abstracts will be reviewed and if accepted, presenters will be invited to submit a full paper. Submitting a full paper will not be a requirement. This will enable students and academics to present their work while still being able to publish in a high impact journal of their choosing. Looking forward to seeing you in early Spring in Melbourne, Australia in August 2015. The 19th Triennial Congress of the International Ergonomics Association(IEA) is in Melbourne, Australia, 9-14 August 2015. 2014-09-25 2015 Applied Ergonomics Conference being held March 16th to 19th in Nashville, Tennessee, USA. 2015 Applied Ergonomics Conference being held March 16th to 19th in Nashville, Tennessee, USA. 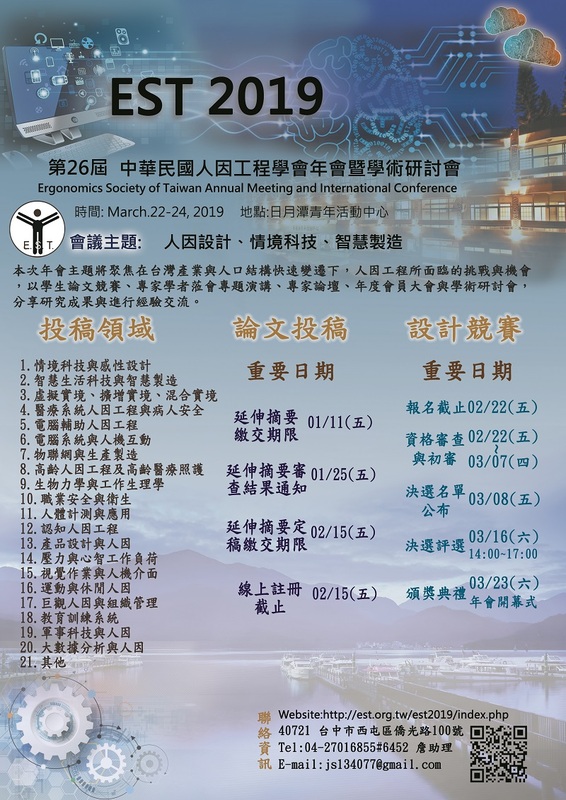 The Conference is a great opportunity to connect with other ergonomic professionals and attend multidisciplinary educational sessions as noted in the first attachment. There are also partnership opportunities for international organizations. If EST would like to become a partner please complete the second attachment and return to my attention. As a Conference Partner, your members will receive a discounted registration. Please note that oral and poster presenters receive a discounted registration fee. 2014-02-21 Job in the US in the State of Washington. The following link is to a job in the US in the State of Washington that is an exceptionally good position to a recent PhD or MS with experience….and in the US.